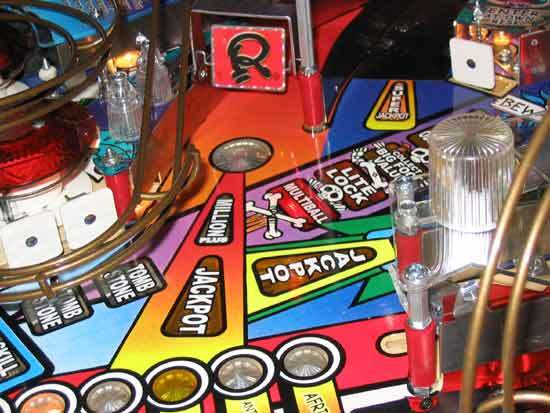 Here we are, once again, for the exclusive in-depth review of another new pinball game from Stern. You've probably seen our other reports about the game and seen the many pictures we've brought you but this is the review where we pull all that information together and discover the main thing that really matters - how the game actually plays. But before we get to that, let's take a tour of the game. This game was running CPU version 0.95 and display version 0.91. Remember, this is a fairly early version of the software and it has since been updated to fix the few bugs we noticed and add a wizard mode. The first thing you'll see of the game is the cabinet artwork and the backglass. I'll be honest here and say I don't find either of them particularly attractive. That's not to say they're not creative and capture the theme well, but that head on the backglass isn't something to show to young children. There is some nice detailing and some intriguing partially hidden artifacts to ponder. The cabinet is largely covered with the Ripley's logo along with the talented Mr Ripley himself and some of his exhibits. It's OK but it's no Lord of the Rings. Speaking of which, the backbox has reverted to a plain black surround and lost the gold detailing found on the previous game. The playfield artwork is gorgeous - rich and detailed, just the thing we hope for from John Youssi. 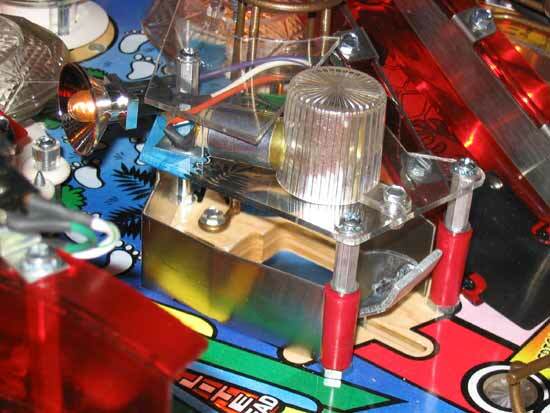 There's a lot of information conveyed to the player from the playfield lamps and inserts. You'll spend much time looking at it, so it's a good job it looks so attractive. 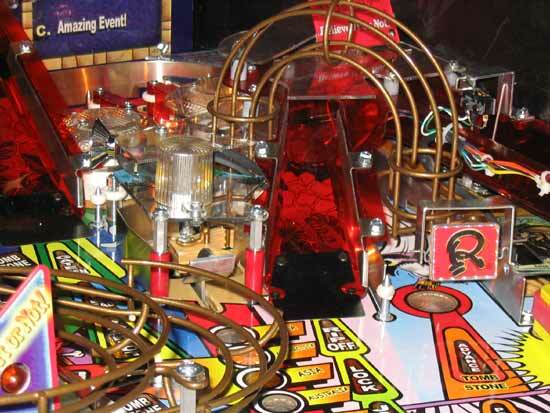 So let's take a tour of that playfield. This is a three flipper, four ball game. The lower flippers are unexceptional but they felt very strong on this game, occasionally causing air balls and the unnerving 'smack' as the ball hits the glass. The strength is just right though. Both flippers can make the long shot to the centre ramp but it needs to be made cleanly or the ball will fall back. 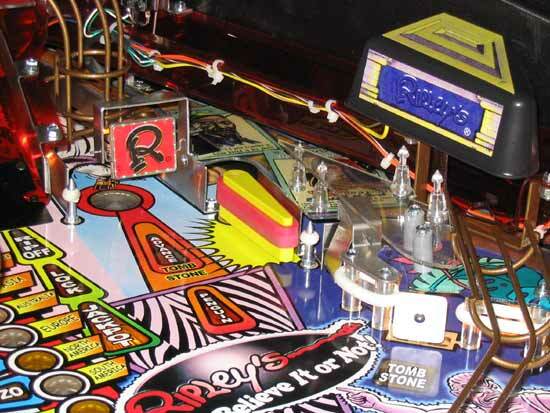 The third flipper is on the upper right of the playfield and is also full-length. 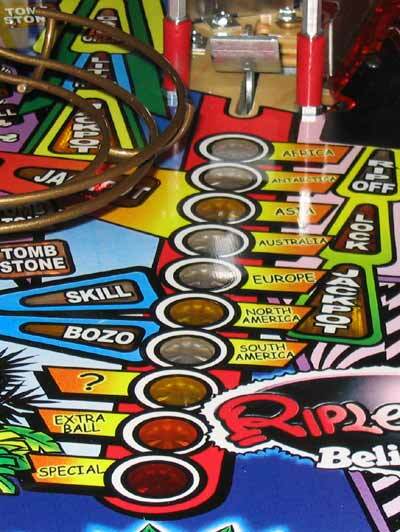 As this game is a UK model it features the All-Skill system of extra posts, hence the up-post with the Ripley's logo between the flippers. Most games will not have this. Above the flippers are lamp inserts showing the current Super Jackpot value. Above those is the Temple Jewel grid. The object here is to get three jewel lights in a row to collect the indicated award. We'll look at how you do that later in this article. Traveling clockwise around the game, there is one inlane on the left which is also fed by two wireforms from the two ramps. The outlanes are quite greedy on this game which compensates for the relative lack of centre drains. You'd think there would be more balls disappearing down the middle given the layout but the only balls lost that way were from rebounds from the tomb stone target shown below. The left outlane also features a Special lamp insert - one of Gary Stern's favourite features and every game must have at least one. As we shall see, this game is more than adequate in that department. Above the left inlane is The Idol. There are no moving parts here but there is a magnet to cause some disruption. A ball entering this area from below is registered as an idol hit and thrown around by the magnet in the same was a The Power does in Addams Family. The ball doesn't fly around too much but it does prove quite entertaining. Speaking of Addams, shooting The Idol generates a Cousin It-like sound. Idol hits accumulate and are indicated by the five lamp inserts in front. You need 25 hits to light an extra ball and presumably there are other awards beyond that. The Idol also features in one of the modes, but more on that later. The ball can also pass through this area when exiting the pop bumpers. Over The Idol is a flash lamp which is worth mentioning. It is unusual because like the other flashers in the game, the lamp is mounted horizontally, with a cut-out in the lamp cover at the back. That means you can't twist the lamp cover off but have to unscrew a nut and bolt to remove it. Also, some of the flashers use red painted bulbs. I couldn't see any good reason for this since they flashed white, but presumably there's a good reason for this. While I'm talking about the flashers, I really must comment on how well they are used and how bright they appear. The lighting effects on Ripley's are excellent and the flashers approach the blinding level of Creature of the Black Lagoon. I hope the high light output doesn't equate to shorter bulb life. Just up from The Idol is a white Tomb Stone standup target. It is used in one of the modes and scores points throughout the game but the position of this one makes it a sucker shot. There are plenty of other Tomb Stone standups around the game and none are as dangerous as this one, so it should only be used as a last resort. 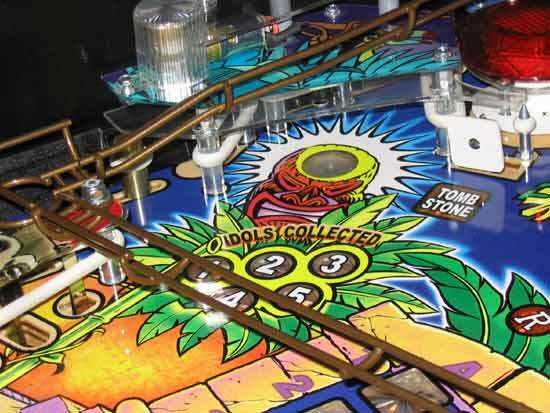 Continuing around the playfield, above The Idol are the lower pop bumpers. There are three of them and - as usual - there is a left loop shot straight through them. These bumpers, along with the other three at the top of the game build up the Bigfoot score. The right bumper has a chopped-off cap to accommodate the scoop. The scoop is an interesting piece of hardware. It looks quite flimsy, having no sides to provide strengthening and avoid playfield wear but works well enough on this new game. There are posts on either side to rebound careless shots and an unusual red-rubbered post behind them. These appear a few times around the playfield and look attractive. Balls can be shot straight in to the scoop from the front to collect awards but it can also arrive here from a wireform or from a side scoop shot. The wireform comes from The Temple (lane C) and does not give any scoop awards while the side scoop shot can be made as the skill shot or from the upper flipper for a Bozo shot. The skill shot from the shooter lane is to plunge the ball into the side scoop. 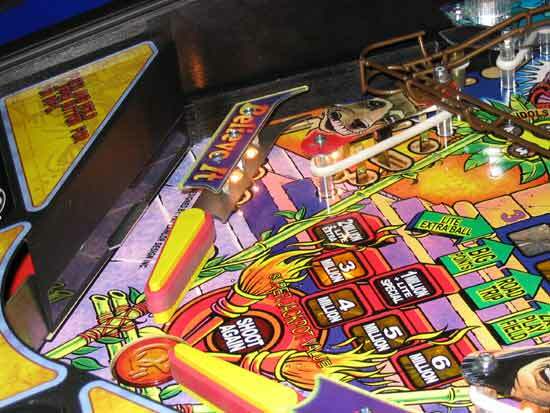 There is a playfield lamp insert to show where to shoot. It scores one million points the first time, two million the second and so on. These are big points and well worth aiming for but not without risk. The display shows "AMAZING" and then 1,000,000 in a font size that is just too large to fit correctly. When you get 2,000,000 and up it gets worse. There is a similar font sizing problem on the high score table when you enter your initials or name and there is no back arrow either. With the manual plunger, if you plunge too hard you can hit the white standups above and rebound down the right outlane. Plunge too softly and you can shoot the ball straight down the left outlane without hitting anything. There is no ball saver for this. If the side scoop shot is made during the game it adds a BOZO letter. Spell BOZO and you get a random award. Bozo is the mind-reading dog, so naturally he can tell what the next award will be and he tells you on the display. There is a big arrow pointing at the scoop with a lamp at the arrowhead to show when an award is waiting for you. We'll look at those awards a bit later. Just above the scoop are two more Tomb Stone standups which can be shot from the upper flipper or from the shooter lane. Then we come to the two upper-left loops. To avoid confusion, I'll call the one on the left in the picture above, the lower loop and the one on the right, the upper loop. 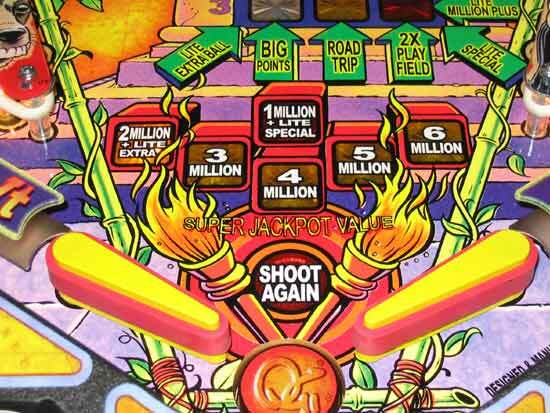 The lower loop is one of the three jackpot shots and is also used for Millions Plus, which as expected scores one million for the first shot, two million for the second and so on. The lower loop feeds the upper-right rollover lanes or, if sufficiently strong, all the way round the right loop to the upper flipper. There is a spinner at the entrance to this loop and a flasher which shows the spins. 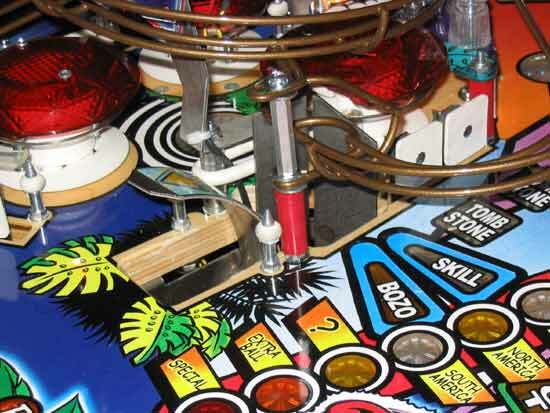 The spinners are used in one of the modes. The upper loop is chiefly used to collect super jackpot awards but it loops back to the left loop and down to the lower pop bumpers. Sitting over the top of the upper and lower loops is The Temple. 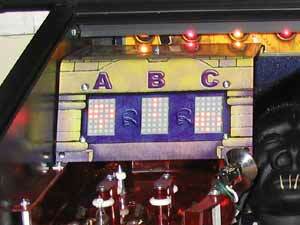 The Temple contains two important elements of the game - the Temple Code display and a loop diverter. The Temple is fed from the centre ramp and when it is not lit, the ball passes straight through the 'A' lane and down to the left inlane. But when it is lit by the right ramp, the ball is diverted into the rubbered area above the 'B' and 'C' lanes where it bounces around before falling into either B or C (and very occasionally A). Now is probably a good time to explain why any of this matters. If you remember the Temple Jewel grid just above the flippers, the columns are labeled A, B and C, while the rows are labeled 1, 2 and 3. So square A1 is at the top left of the grid and C3 is the bottom right. At the start of the game, three semi-random jewel lamps are lit and you can collect others from The Temple. Below each of the A, B, C letters on the temple is a 7x5 single colour LED display showing a number - either 1, 2 or 3. These numbers are generated at the start of the ball and can be changed during the game. Whenever the ball rolls through an A, B or C lane, the appropriate square is lit on the grid. So if lane B shown a '2' and the ball rolls through lane B, square B2 is lit on the grid and if that makes three in a row, the indicated award is given. Since an unlit Temple will always award an 'A' square, completing the 'A' column is the least attractive award on the grid. Lane A leads to the left inlane, lane B sends the ball to the scoop while lane C drops the ball into the lower loop. The Temple is a bit disappointing in terms of styling. It is only a bent metal sheet with artwork to make it look more impressive. It's OK from the front but from the side it looks much less attractive. Also, it only uses plain red LEDs and not the bi-colour ones seen on The Simpson Pinball Party. Next to The Temple is the Shrunken Head. You might expect the head to move but it doesn't. Animation is achieved by a magnet underneath the head which grabs the ball and either lets it drop completely if the head is not lit, or lets it drop slightly and then throws it under the head to the upper right rollover lanes, in same way The Shadow does with its ball lock or The Ring in Lord of the Rings. 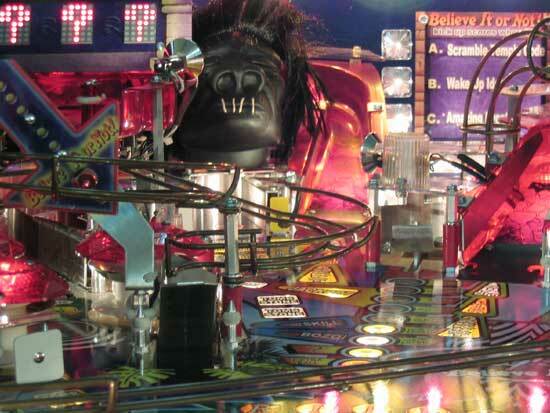 The Shrunken Head is an important shot in the build up to multiball as it lights lock and starts multiball. It also features in some of the game's modes. There are two Tomb Stone targets either side of the head which are probably the safest Tomb Stone standups in the game. 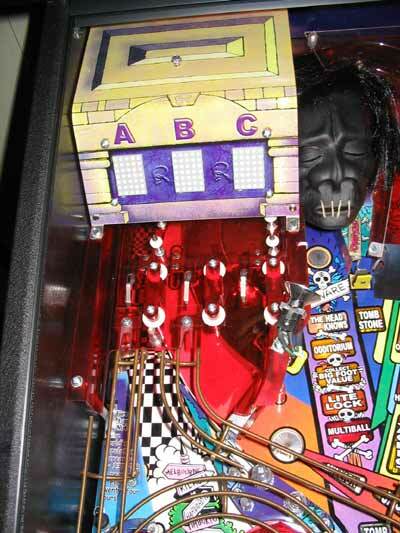 They also act as Shrunken Head hits in one of the modes. Next to the Head is the centre ramp. This is sometime referred to as the left ramp in the game which is a bit confusing. This ramp feeds The Temple - lane A if unlit, lanes B &C if lit. The centre ramp is one of the three jackpot shots and can be made by either of the lower flippers. It also lights the Shrunken Head. To the right of the centre ramp is the vari-target. Vari-target is not quite the right name as it implies the target does more than it really does. The instructions call it a "variable push target" but in fact it is really a two state target. You shoot it and the ball pushes it back. If the ball is fast enough, the target is pushed all the way back and it locks, exposing a sink hole for the ball to drop into. If the ball isn't fast enough, the target pushes the ball out and returns to its home position. In either instance, the target registers a hit but if the ball drops into the sink hole and the target is lit, a mode is started. Balls entering the sink hole are kicked out with a vertical up kicker, over the right ramp and into the right loop lane. There is another bright flasher above the vari-target. In this instance it is clear why the flasher has the horizontally mounted bulb. The target is also used to collect extra balls and another special can be awarded here too. When the vari-target is not lit, shooting the sink hole adds a letter to RIPOFF. To the right of the vari-target is the right ramp. The right loop is the third jackpot shot, locks balls and starts Ripoff. 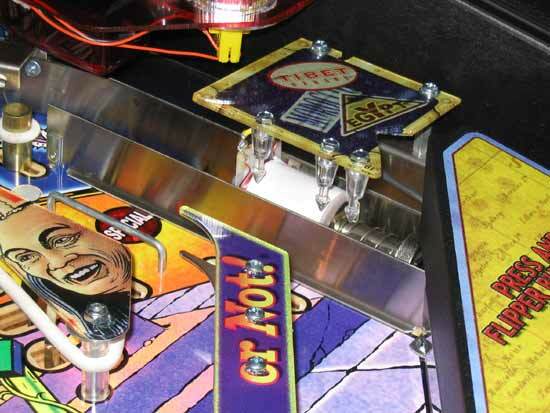 It bends back about 150 degrees and travels down the right side of the game to a diverter which sends the ball either across the playfield to the left inlane or into the ball lock area. Above the right ramp and the vari-target are the upper right rollover lanes and the upper pop bumpers. Completing the rollover lanes increases the bonus multiplier and gives you an appropriate display for the multiplier. So a 2X gives you a two-headed animal, 3X is a monkey painting three pictures at once, 4X is a four-horned goat, 5X shows some exceptionally long fingernails. This last display is repeated for 6X. At 7X an extra ball is lit and thereafter points are awarded instead. 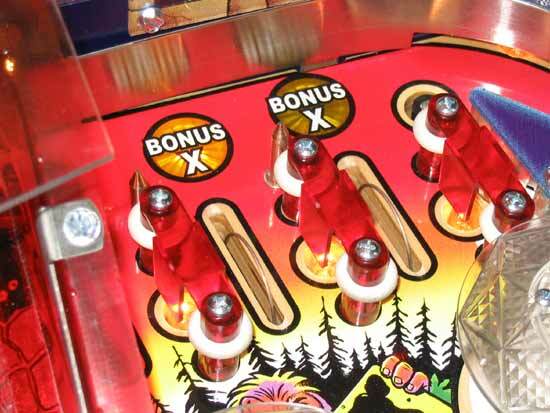 The pop bumpers increase the bigfoot value and can send the ball back into the rollover lanes. There are two possible exits from these pop bumpers; the right loop or behind the vari-target by the entrance to the centre ramp. From there the ball rolls down past the scoop. 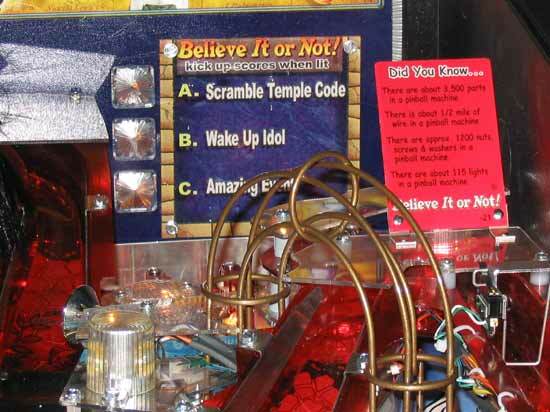 Behind the rollover lanes on the back panel is a sign with three awards: Scramble Temple Code, Wake Up Idol and Amazing Event. These awards are given when the ball enters the sink hole in the vari-target and is kicked up by the VUK to the right loop lane. It's not clear whether they relate to The Temple's rollover lanes or the Temple grid. The final shot is the right loop. This has the second spinner at the loop entrance and a flasher below. This loop scores penguin laps (I kid you not), increases the Tomb Stone values and either feeds the upper right rollovers or the left loop depending on the strength of the shot. The right loop has another feature. If the ball is shot here after rolling through the left inlane, a post rises just before it gets to the rollovers stopping the ball. The flashers go mad and the ball then rolls back to the upper flipper for a shot to the lower loop which is lit for a penguin jackpot. Just below the right loop entrance is the upper flipper. It can shoot the Shrunken Head, the upper and lower loops, many of the Tomb Stone targets and the side scoop entrance. It can also get a weak hit on the vari-target but not make the sink hole behind. Down from the upper flipper is the shooter lane exit which, apart from the side scoop entrance, can also hit the Tomb Stone targets of make the lower loop up to the upper right rollovers. Under that is the final Tomb Stone target. Finally we come to the lower right area of the playfield. There is only one outlane and one inlane in this area but there is also a ball lock lane between the outlane and the shooter lane. The ball lock can hold up to three balls (although it will normally only hold two) and kicks them all out at once through a gate above the right outlane entrance. Locked balls arrive here from the right ramp and via a ramp diverter. Balls are not kicked out of the lock at the end of the game by default. Any balls sent to the lock in the following game are diverted to the left inlane with the software registering a virtual ball lock. Finally we have the right outlane which, like the left, can award a special when lit. So specials can be collected from both outlanes and the vari-target creating plenty of chances for paying players to keep going. So that concludes the tour of the playfield. 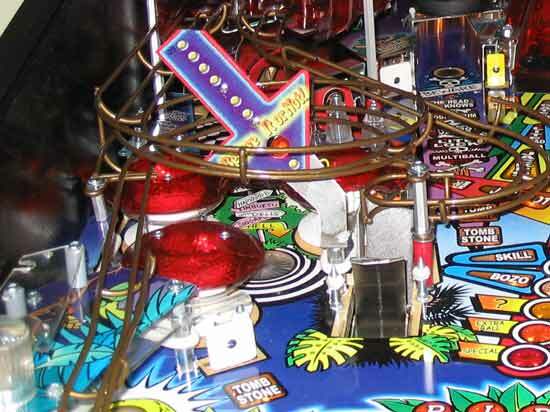 Now let's look at the rules starting with multiball. So after four shots to the head, lock is lit on the right ramp. Two balls need to be locked, either for real or virtually and then the final head award is to start multiball. The display animations for the build up to multiball show a man putting pool 8-balls into his mouth. One the first lock he puts one ball in his mouth, then two and when you hit the head to start multiball, he throws out three balls from his mouth. Believe it or not! 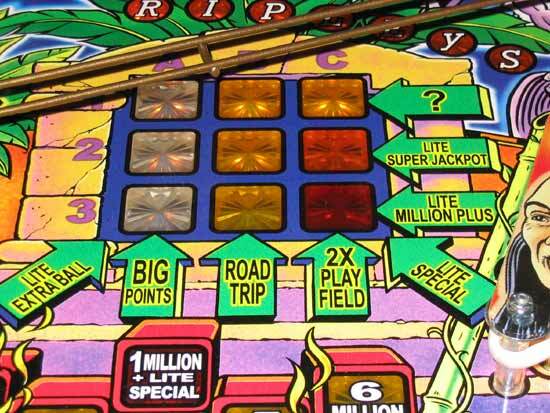 One into multiball, the centre and right ramps are lit for jackpots. Once a jackpot shot has been made it stays unlit until the other jackpot is collected. After two jackpots have been collected the super jackpot is lit at the upper loop. The award value is shown just above the flippers. Also, when both jackpots have been collected, the ramps relight for jackpots and the lower loop joins them. Again, you have to collect all three jackpots before they relight. 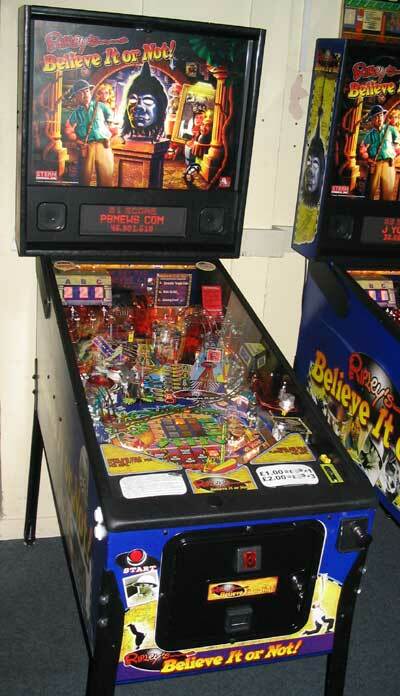 These are then the three jackpot shots for the rest of multiball. The jackpot awards are well signposted and the super jackpot is well worth collecting just to experience the light and sound show. A good way to draw attention to yourself in a quiet bar. Now to look at the modes. There are seven modes and they relate to each of the seven continents. Modes can be started at the scoop or at the vari-target when lit. The vari-target is relit by the right ramp. The scoop can be lit by shooting it three times when unlit. The objective is to spell R-I-P-L-E-Y-S by collecting letters. You collect letters by visiting the continents and completing their modes. By a strange twist of fate, there are seven letters in R-I-P-L-E-Y-S and seven modes, so win them all and you'll have all the letters. When you complete R-I-P-L-E-Y-S the mystery eighth continent is lit, but more of that later. The game is narrated by Mr Ripley himself and the shrunken head. That's right, even the disadvantage of having his mouth stitched shut doesn't stop the shrunken head joining in. When you start a continent mode the display shows "Travel with Ripley" and Mr Ripley says "It's time to visit..." followed by the continent name, just like this. The display then shows the objective and how to achieve it, but the instructions are not shown for long enough, so you're doing a lot of guess work. Most modes are timed with a default 30 seconds duration, but two of them are two-ball multiballs and end when one ball drains. The clock continues to count down when the ball is in the bumpers which is rather annoying and sometimes you are not given a verbal countdown, so the mode can end unexpectedly. 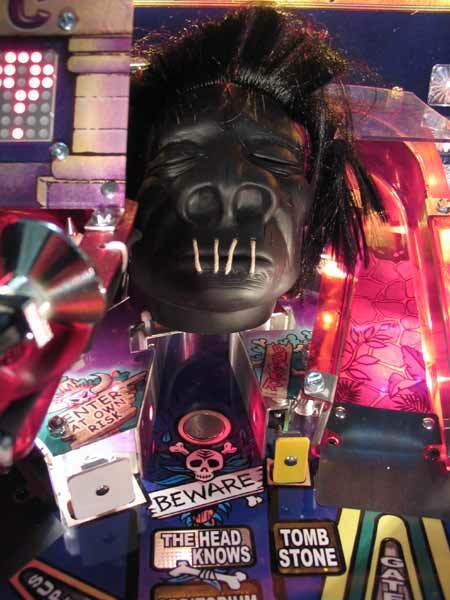 Shoot ramps to light Bigfoot jackpots, collect them at the shrunken head. Collect four jackpots to complete. Continue until a ball drains. Shoot ramps for jackpots then The Idol to relight them. Collect four jackpots to complete. Continue until a ball drains. Collect six Tomb Stones to complete. Further Tomb Stones score 150K, 155K, 160K etc. points. Shoot vari-target four times to collect boomerang jackpots and complete. Strong shots to the sink hole score twice. Once complete, a countdown starts for boomerang awards at the vari-target until the countdown finishes. Shoot spinners to get twenty-five spins and end the mode. Shoot head four times to complete mode. Once complete, a countdown starts for awards at the head until the countdown finishes. During these modes the scoop can be lit for helper awards. These awards are context sensitive, so during a 2 ball multiball you might be awarded an added ball, or during a countdown the award could reverse the direction, turning it into a count up. If you don't want to know what happens when you've collected all the R-I-P-L-E-Y-S letters or played all the continent modes, skip the next three paragraphs of light coloured text. Once you have played all the continents, shooting the vari-target gives you the seven continent bonus. This quickly re-awards your scores for the previous seven continents which should total around 10M-20M. All the continents are then unlit and you can play them again to collect any missing R-I-P-L-E-Y-S letters. On version 0.95 of software on this game, that's all there was at the end even if you suceeded in collecting all the R-I-P-L-E-Y-S letters. In the latest versions, once you collect all seven R-I-P-L-E-Y-S letters the vari-target is lit for the mystery eighth mode, Atlantis. At the time of writing, this mode has not been fully implemented in the current version (0.99) of software, but will be finished in the production versions 1.00 onwards. When the ball ends, your final bonus is made up from your ball bonus, the number of R-I-P-L-E-Y-S letters, the number of Idols and the number of Temple Jewels collected multiplied by the bonus multiplier. This can be worth several million points. The Temple Jewels are the lights on the Temple grid and are worth collecting along the way with regular shots to the right ramp (to light) and the centre ramp (to collect), since there are some nice awards there. While most of them are obvious, Road Trip lights all the main shots for extra jewels and a jackpot score. "?" is a semi-random seven digit points award that is revealed for you on the display. It's worth mentioning the extra ball animation which is rather more than a homage to Indiana Jones, but I'll leave that for you to discover. Finally a couple of other references. The head occasionally says "right back at you", a Rudy quote and take a look at the back panel artwork for references to relevant towns in Illinois; Marengo (Pat Lawlor's home), Harvard (PLD's office address) etc. There's no doubt this is a fun game to play. There's plenty of ball flow around the top of the playfield with those penguin laps and ramp shots. The sounds are very well executed and I've mentioned the superb lighting effects. The dots are well designed but often seemed to lack the information I needed at the time. If I have to make four shots in a timed mode, I always need to be able to look up and see how many shots I have to make and how much time I have left at any moment. Playing a new pinball game, like Ripley's quest, is a journey. Sometimes you start out on familiar ground, and then diverge from the worn path into new territory. But sometimes you walk out the door and realise it's not a door you've opened before and you're totally lost. Ripley's Believe It Or Not contains a bit of both these scenarios. There are some elements you think you recognise, such as the scoop (that's the Addams scoop isn't it?) but then you realise it's not really the same and you look for signposts to guide you. Ripley's doesn't hold your hand for you and invites you to look around for yourself. Go out there and have some fun exploring. I'm sure Mr Ripley would be proud. What Ripley's Believe It Or Not! lacks is the depth of some earlier games but it compensates by making the initial offering all the more attractive. Perhaps the best sentiments to sum up the game would be "it is better to travel than to arrive" and "if you're going to travel, travel in style". A big thanks to John Stergides and Bob Nicholson of Electrocoin for their assistance in making this report. I know John is very excited about this game and he's delighted that it has two spinners and six bumpers - two features he's sure will make the game a winner. Thanks also to Pat Lawlor for clarifying the wizard mode and software revisions.